It is no secret that Mr Farmer bring you work wear that is tough enough to take it rough. Born in 1950, we have continued to grow as one of the market leaders in supplying all industries in the market, from industrial factories, farms and mines, displaying excellent workmanship and quality that can be worn with pride. Mr Farmer also stocks a wide range of quality promotional – and leisurewear. Mr Farmer’s owner, Chris Lombard, together with his capable management team, will ensure that you will get the best customer service you deserve. Our team of sales consultants are dedicated to providing you with the right products, service and support suited for your individual needs. Mr Farmer specialises in the manufacturing of work wear tailor-made for your every need. Items can be personalised by either embroidering or printing a company logo on the garments. 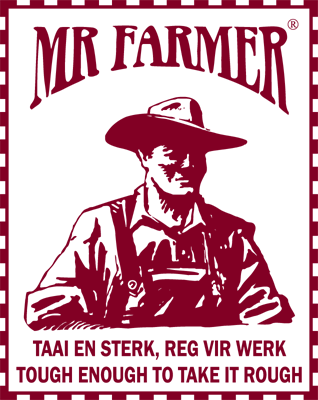 We thank you, our valued customer, for making Mr Farmer the one-stop work wear shop!